Ok, so all sanity went out the window when I discovered Kiko Make Up Milano was where I was shopping. I tried to be sensible and almost succeeded. Thank goodness it’s not easily accessible for me or I’d end up buying everything! I went in with the intention of buying an eye primer, ready for glitter season. The thing is, they have two – eye base and pearly eyebase. I just can’t hope with too many choices so that was a bad start! I spoke to an assistant and she advised me to go for one of their infinity eyeshadows in a colour close to my skin tone instead. Argh, another option! I spent ages trying to figure out what to do. I then tried loads of lipsticks and eyeliners and settled on the Ultimate Pen Long Wear Eyeliner – a felt tip eyeliner for a 60s look I want to try. Just in case you don’t know, the stuff in Kiko is really pigmented and has super strong staying power. My hand was a right mess, even after I washed them in bubbly water in Lush! I liked the look of the Christmas limited edition eyeliner in green and purple but figured I ought to exercise some restraint and bought only the Infinity eyeshadow in 204 and the eyeliner. I then went back after doing some shopping to get another eyeshadow, this time a golden bronze colour 257. 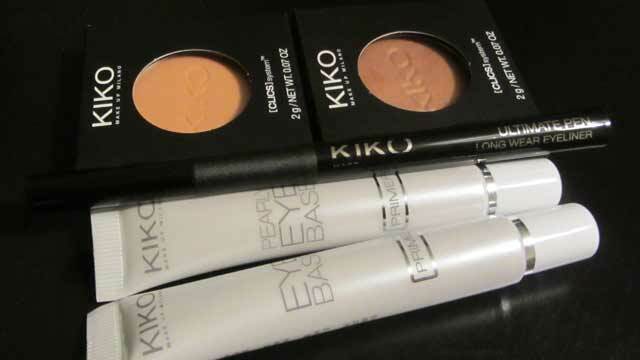 My search for an appropriate cream eyeshadow failed which is why I returned to Kiko. Even though all the eyeshadows are powder, they glide on like a cream. I wanted this to try a look from the final episode of Sky Living’s The Face. This time I saw a different shop assistant and she recommended that I get the pearly eyebase to go with it so it stands out against my skin, as me and the eyeshadow were almost the same colour (except I’m not shimmery). She put a dab on my hand but I declined to buy due to my original dilemma and just bought the eyeshadow. After leaving the shop I tested the eyeshadow, some on the base and some not. The base made a huge difference! So back I went into the shop for a third time like a crazy person to buy BOTH the eye base and the pearly eyebase. I then had to go home before I bought anything else. Uh oh, I hadn’t noticed the setting spray! I need to get it now, and I’ll probably end up getting 6 other items too!